In the left corner: the Rokinon (a.k.a ‘Samyang’, in some parts of the world) T-S 3.5/24 ED AS UMC, from Korea. In the right corner: the Nikon PC-E 24/3.5 ED. One weighs in at a hair under $2,000, the other, closer to $850. I have to be honest, the Samyang has only come onto my radar because of the enormous difference in price – I admit curiosity as to what we’re really giving up for the delta. 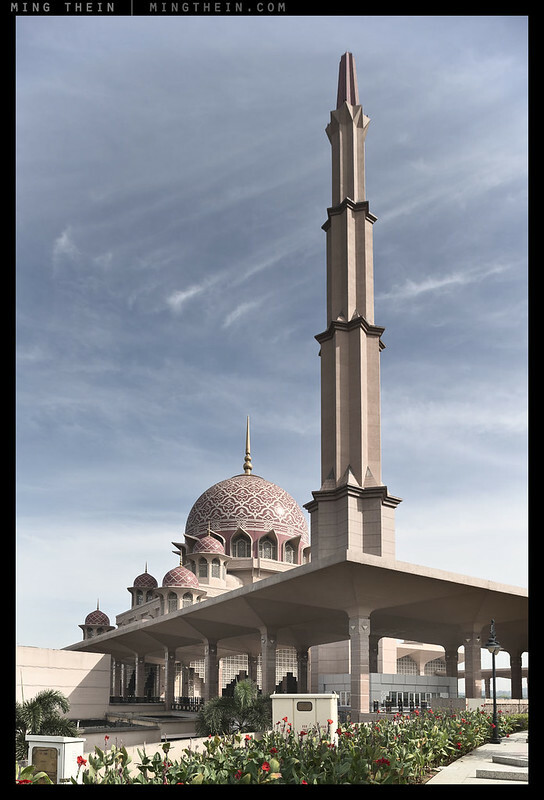 The only real uses for these lenses – other than bragging rights – are to shoot architecture; Putrajaya’s Putra Mosque plays host to us for this testing session. Technical notes: During this test, I shot both lenses from the same tripod position with the same settings on the barrels – distance, tilt, shift, aperture. Nevertheless, there are still some slight differences, which I think are a combination of sample variation and lack of precision in the focusing scales of both lenses; infinity to 1m are barely five millimeters apart on the barrel – about seven degrees of travel, by my reckoning. Live view was used to match subject sharpness as closely as possible. Testing was done on a D800E body, at base ISO with self timer used at all times, on a locked down solid tripod – a Gitzo 5-series carbon systematic and Arca-Swiss Cube head. 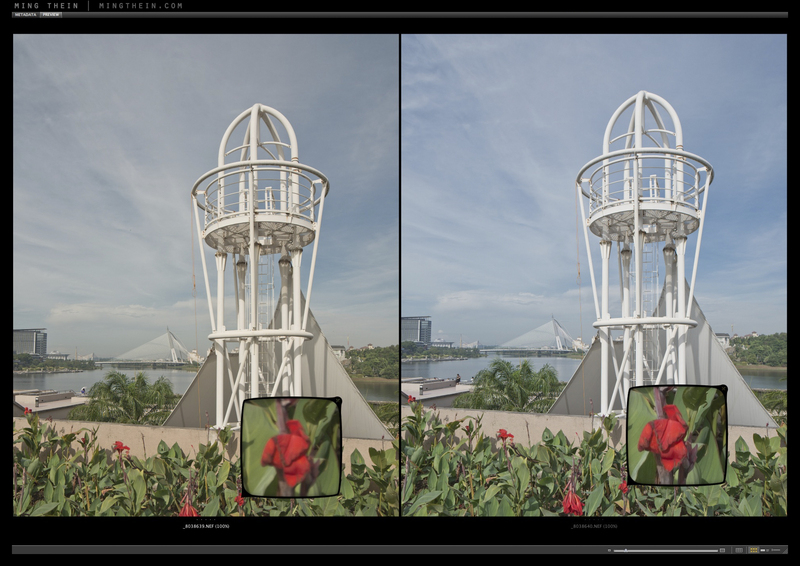 Whole-shot sample images were shot using the Nikon; in the A-B comparisons, the Rokinon is always the warmer image. I think it’s necessary to start with a little background on why movements are required at all. Firstly, in all of these images you’ll notice my verticals are perfectly vertical – there’s no keystoning despite the perspective and physical camera location. This is due to the ability to shift the lens: you can effectively project a vantage point higher than your physical one by raising the optics up. Geometrically, this uses a peripheral portion of the lens to project an image onto a sensor. 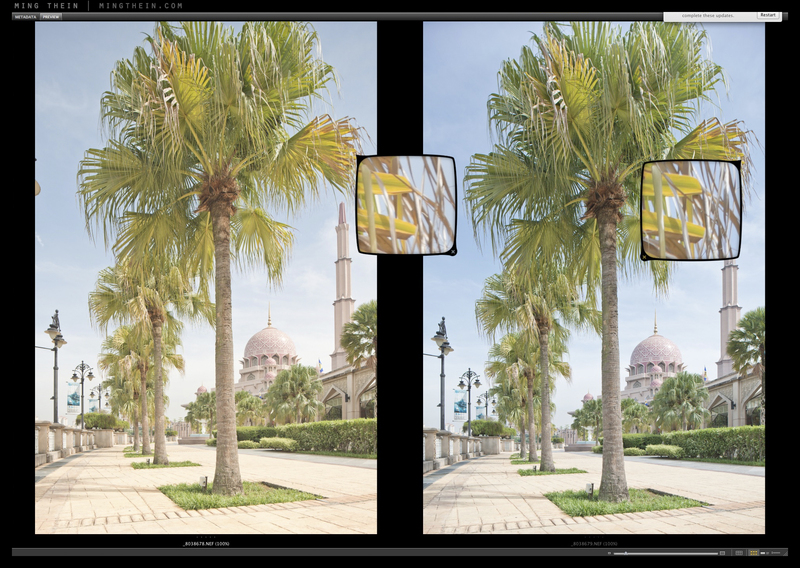 If you need extended depth of field beyond what you can achieve by stopping down, then the only choice is to tilt the focal plane – this extends depth of field beyond the normal distance, and in three dimensions. Imagine the imaged area – in focus, framed – as a rectangular block standing on one edge. By tilting and shifting the lens, the block can be laid down, moved up and down, and tilted. It’s a bit more complicated than that, and requires some practice to use with fluency, but that’s the gist of it. The Nikon is a fairly familiar lens to me – I’ve used it on several occasions in the past for architectural work. Build quality is excellent, it has mostly excellent optics with a few minor qualifications, and one big shortcoming: the tilt and shift axes are not independently rotatable. The lens itself is almost entirely metal, very solidly built, is fully gasketed and weather-sealed, and has smooth geared controls for moving the axes, as well as lock knobs for securing position*. The focusing ring is perfectly weighted and well damped for precise positioning; it could use a bit more throw near the infinity limit, though. There’s an aperture ring whose position overrides the command dial selection on the camera body; it has an ‘L’ position at one end, which when selected returns aperture control to the camera. The PCE’s are unique in the Nikon lineup for having electromechanical diaphragm control only (all other Nikkors are mechanical, triggered from the camera body). This means unlike the previous 85/2.8 PC-D which stopped down with a plunger, all of the current PCE lenses require and electronic body for full functionality – unless you want to shoot wide open. They will not work properly with older bodies. It’s probably also worth mentioning that for the extra money, the lens includes the customary velvet baggie to store it in, along with a dedicated hood. Note: on Nikon bodies with a built in flash, you can only rotate the lenses – both of them – one way and they must both be mounted with the movements at neutral: otherwise you won’t have enough clearance. Unfortunately, this also means that you can’t access the lock knob for some axes in some orientations because it’s small and directly blocked by the prism. Oddly this isn’t a problem I’ve had with the 85 PCE, but then again I think it’s because the lock knobs are further forwards. By contrast, the Rokinon forgoes the hood but includes a slightly less-nice baggie (I don’t even think there is a hood for it) and is completely mechanical – there aren’t even any electrical contacts on the lens, which means you’ll have to use a D7000 or higher to get automated metering. It’s also got an awkward 82mm filter thread (the Nikon is 77mm). The aperture is stop down only, which means your viewing aperture is also your shooting aperture; you’ll have to add another step to the workflow in opening up to focus, then stopping down again to shoot. A little too easy to forget if you’re in a hurry, personally. Build quality is a step up from the plastic-fantastic consumer zooms, but not by much. The focusing ring has a gritty feel to it and more resistance in some places than others; the aperture ring detents aren’t very deep and easy to knock off. There is certainly no weather sealing, and though the weight suggests there’s some metal in the lens, the feel makes it difficult to pinpoint exactly where, besides the mount. By far the worst thing about this lens is the locking and geared movement knobs for the tilt and shift axes, however. The diameter of the locking knobs is very small, so it’s difficult to bolt down securely – if left unlocked, the lens will drop to its lowest position – by comparison, the Nikon does not. Compounding this is relatively low resistance to movement in both axes and poor choice of gearing ratios, making it difficult to adjust the lens in the precise small increments required for this kind of technical photography. But the Rokinon has one enormous saving grace: it can rotate its tilt and shift axes independently, something which the Nikon cannot do. 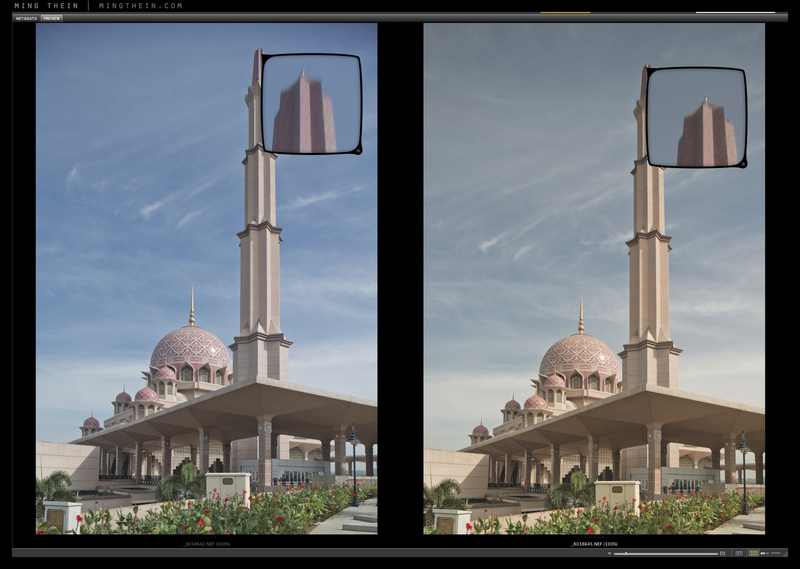 This is incredibly useful in practice for both architecture and landscape as it means you can combine rises with tilts for greater DOF and perspective correction; the Nikon gives you one or the other. You can have the axes rotated 90 degrees at a service center, but that’s permanent and requires a new cable flex to join the two halves of the lens – something which Nikon (at least in Malaysia) are happy to charge you the better part of $400 for. This is daylight robbery on top of an already expensive lens which should just have been designed with a slightly longer cable flex to begin with, so swapping axes would be as simple as removing and rotating the back mount**. Better yet, design the damn thing so the axes rotate independently in the first place. Both lenses offer +/- 8 degrees of tilt, and +/- 11mm of shift on the Nikon, +/- 12mm on the Rokinon. **They did it on the earlier 85/2.8 PC-D. 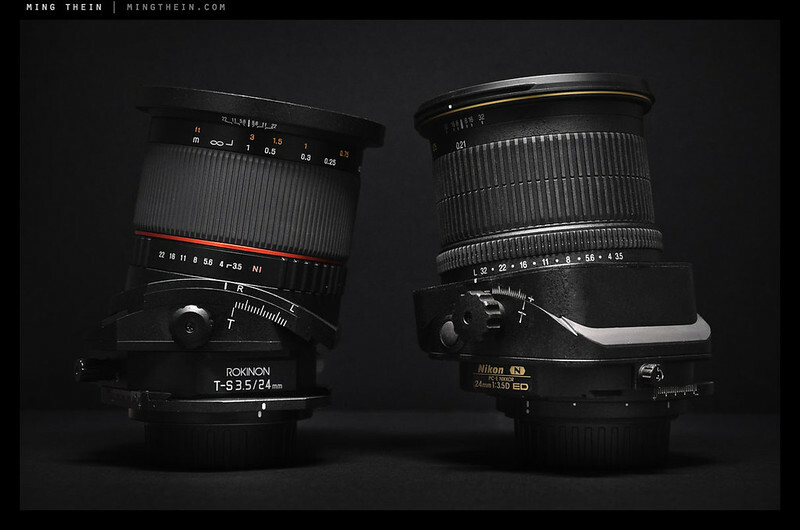 I think at this point it’s clear that both lenses have their strengths and shortcomings. But what about the most important part: the optics? The Rokinon runs a 16/11 optical formula, with two aspherical and two ED elements. The Nikon is a more sophisticated, but simpler, 13/10 design with three aspherical and three ED elements, plus Nano Crystal Coating and a rounded 9-blade diaphragm. The Rokinon has six blades and a UMC coating. Given that most of the time, these lenses will be used in controlled situations – i.e. stopped down and on a tripod – I didn’t bother to test wide open performance in detail; I can’t actually forsee any situation in which you’d have to shoot these wide open – unless perhaps future DSLRs have such high pixel densities that diffraction comes into play at say, f4. Consequently, most of these tests were done between f8 and f11. Nevertheless, with all movements in the zero position, it’s clear that the corners on the Rokinon are much softer than the Nikon until f8, at which point there’s actually not a lot to choose between them. The Nikon improves a little from wide open, but it starts out already very good. 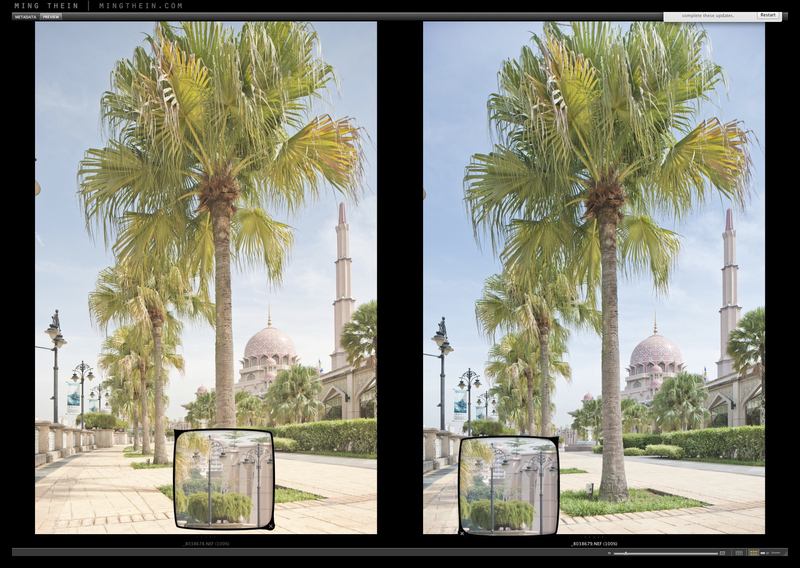 It’s a similar story with near performance: both lenses will focus down to about 0.2m, which makes them good for very dramatic perspectives – though not very accurate rendering due to geometric distortion. Both lenses are excellent in the center, with the Rokinon exhibiting edge fall off until stopped down significantly; the Nikon is much, much better in this regard. Stopped down to f8, it’s a different story. Both lenses are sharp across the frame except for the extremes; there’s a hair more CA on the Rokinon and the Nikon has better microcontrast and transmission (to be expected thanks to its sophisticated coating). Neither one does well at the edges of its image circle – i.e. the extreme movements – and the D800E is particularly revealing in this regard. I wouldn’t go beyond 5 degrees of tilt or 8mm of shift on either lens; things at the far edge start to fall apart visibly after that. It’s not coma, it’s not CA, it just appears that the lens is having trouble focusing all of the light rays to the same point. In practical terms, there’s actually not a lot to choose between them in terms of resolution and rendering style, except for two areas: color and vignetting. The Nikon vignettes heavily at the edge of its image circle; you can correct for this, but curiously it isn’t necessary on the Rokinon. This limits practical movement distance a little more, I think. The Rokinon suffers from color casts; images are warm and hue-shifted orange. It’s not an even spectral shift either, so this isn’t something that can be corrected for via the eyedropper tool – you’ll have to profile this lens separately if you want it to match the other glass in your collection. The Nikon of course renders like every other modern N-coated, ED Nikon – high macro contrast, moderate to good microcontrast, neutral to slightly cool color, and very saturated. even though they were set to the same movements and focusing distances; furthermore, I also double checked the focus point with maximum magnification in live view. Miscalibration somewhere? Sample variation? Or very small movements producing noticeable effects? Possibly all three. I personally suspect the culprit is the Rokinon’s rather vague center tilt detent and somewhat loose locking screw; though when there’s movement of any sort involved in a lens coupled to a very high-resolution sensor, in a way you’re really asking for trouble. Both lenses are available from B&H – the Rokinon 24/3.5 TS is here in Nikon, Canon and Sony Alpha mounts, and the Nikon PCE 24/3.5 is here. How does one go about profiling this lens to remove the orange color cast? Thanks for that. You are right, I was referring to the Samyang. I have been noticing a colour cast on most of the photos I have seen online that have been taken with it. Unfortunately, in this case, because I am shooting with Nikon the Samyang may be my only option. The Nikkor equivalent lens has a fixed relationship between the tilt and shift axes and changing that requires service centre intervention, not sure I like that. I thought about getting a used one but not sure. I will be using it to creatively photograph our yardage screen printed fabric and tables draped with Belgian linen table cloths, our products. 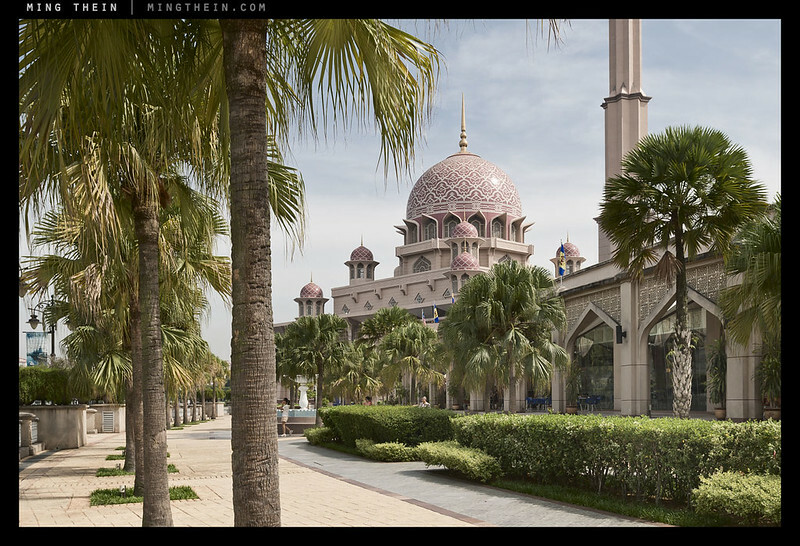 The current version of the 24mm Canon lens seems to be the best of the three. I think I will just bite the bullet, get the Samyang and live with it 🙂 Once I get it, I will post an update with my impressions. Again, thank you for the reply and the link. Very much appreciated! There’s also the 19 PCE, which is probably the best of any of the wide TS lenses. It isn’t cheap though and to be honest I never really found tilt useful – only something to accidentally knock and cause softness. Stop down to f11 and don’t really worry about DOF, even with the 24 PCE (and moreso due to the field curvature). I’m happy to see this chain living on! Anyway, thank you for your great review. I have both the Nikon 24 and the 19 T/S lenses. The latter is utterly superb; if only Nikon would update the 24! I digress. What I’m wondering about is whether you have seen dreaded field curvature focusing issues with the Nikon 24 T/S. I find this lens very, very sharp with my D850 with proper technique. I can’t say that I’ve seen unpredictable focusing issues that some complain about. Here’s one article discussing the problem: https://tashley1.zenfolio.com/blog/2012/7/the-24mm-pc-e?fbclid=IwAR254aDsdutMVkcO6wQJrNjdYrfU3aBtUoF0MkgiRTP_ZZfWEMXUvuR08G4. I was afraid you were going to say that (re field curvature)! I know architecture photographers who have sold their entire Nikon kit to switch to Canon just for their ostensibly better tilt-shift lenses. I’m very reluctant to do that because a) I love my D850 b) don’t want to take the $ hit and c) don’t really believe in jumping ship for such specific motivations. Canon and Nikon go back and forth in the race to produce the “best” in the various categories. It’s a never ending game. But I’ll do what I need to do for my clients. Also, maybe my technique is ok for such a lens because I don’t feel like I see focusing issues very often. I always shoot at f/11 or so. 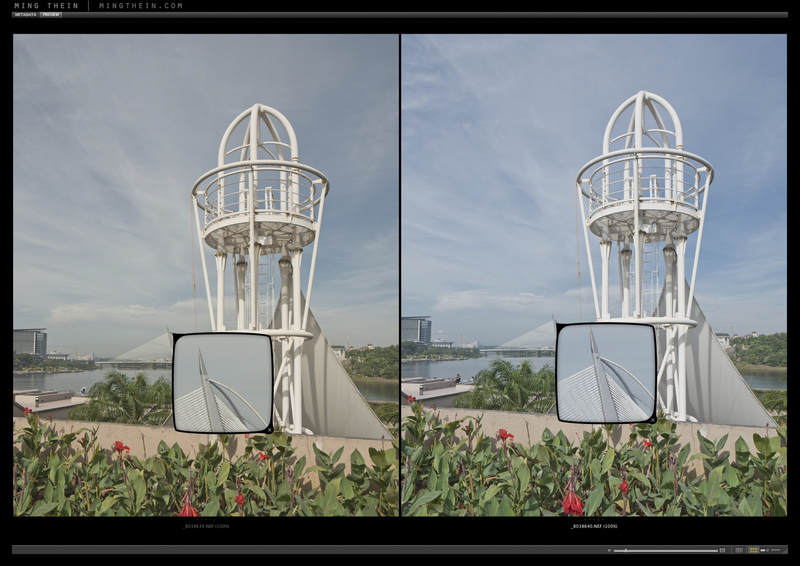 To be honest, since getting it I usually just compose for 19mm and not crop – or if I do, it’s to 5:4 or something rather than changing both dimensions and keeping the aspect ratio. I don’t work tethered because it’s a faff and honestly…not much point unless a client wants it (mine usually don’t). “You can have the axes rotated 90 degrees at a service center, but that’s permanent and requires a new cable flex to join the two halves of the lens” Once this is done then can I rotate its tilt and shift axes independently,? Sadly not. The new orientation is still fixed after that. Yes, indeed. And that would be very useful for stitching with a fixed entrance pupil. When the light is right, 4×5 with film is great fun and very satisfying for architecture – at least if you are a hobbyist who does not need to please clients on short time frames. (My position.) But digital has one huge advantage: when the light is not right, digital offers the ability to do multiple image capture to tame DR. I was shooting a church interior this weekend with 4×5. The morning sun was hitting the stained glass windows at the front of the church, giving about 16+ stops of range. No way I can handle that with film. If I do zone system tricks, I end up killing the mid-range micro-contrast. I took the Ebony off the tripod and put on my D600. It really limited what I could do without geometric distortion, but I could control the contrast easily. Got me thinking about PC lenses, which made this the perfect review to see when I got back to my computer. A digital back for the 4×5 would give you the best of both worlds, I suppose…the problem with the PCE/TS lenses is that they don’t give you as much range of movement, and no swings. I’m not following here. A swing is the same as a horizontal tilt, right? You are saying that this is not possible with TS lenses? Thanks for the clarification. 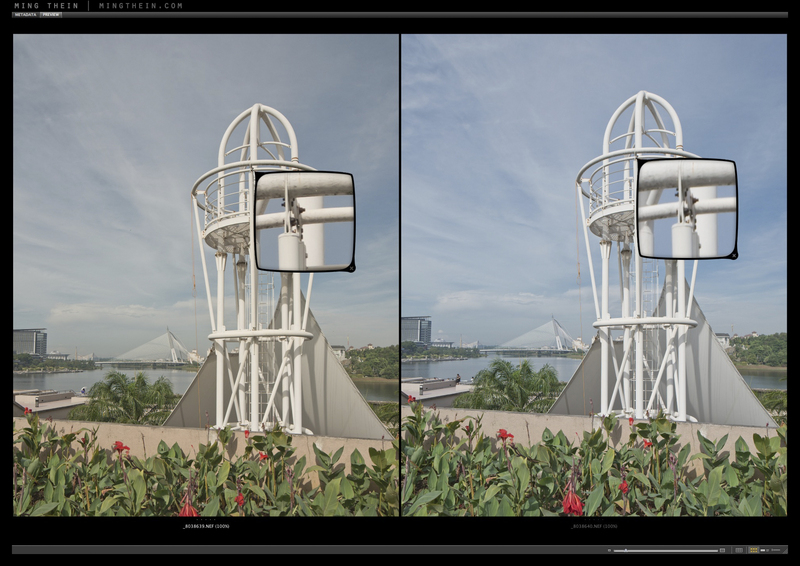 Sorry, bad terminology on my part – you can’t move the sensor plane independently from the lens plane. You can move the sensor plane independently, it is just more of a pain. You have to tilt the camera to move the sensor plane, then compensate with lens movements. Only if you have a huge amount of money. :-) If money were no object, I would love one of those 6×7 technical cameras with all geared movements and a digital back. That’s true – I suppose if you have a Schneider T/S where the lens itself has a tripod mount, this would be easier (assuming the mount is in front of the moving bits). Not necessarily – 4x5s aren’t that expensive, and if you have a digital back already, then it’s moot. That said, I bought a second hand digital back (a CFV-39) for somewhere between the cost of a D4 and a M240, which I thought was very reasonable. I priced up a full Arca-Swiss 4×5 system with Schneider APO Digitars, and it came to about the same again (though more after the recent currency shift, probably) – significantly less than a new entry level MF digital system, or even a pair of pro 35mm DSLRs and a decent set of lenses. I’m not afraid to hack my equipment. Could the small knobs on the Rokinon be changed easily for something larger? Unfortunately not, if the knobs were any larger they’d hit each other when the axes rotate independently. Nice comparison. Very informative. I’m looking forward to the day when Ming tells us the advantage of using “real” movements with a 4×5 studio camera (or larger). Insert Wink. FYI. 4×5 black and white film can be easily developed at home with some Patterson equipment and a mod54 film processor. I expect everything else to be a very similar process to your Hasselblad. When I first took the leap, I went from 35mm to 4×5. I never regretted the jump. And was quite surprised how easy it was to develop it at home. (especially after being proficient in developing 35mm). Although my scanning and post processing was never able to reproduce the ‘micro-contrast’ you been able to pull out of your files that we see regularly in your work. I’m going to forego narrating the virtues and self-accomplishment from using a 4×5 camera and the affordability of such a system before I begin growing horns. I am looking forward to reading that article though. Agreed – I think you need to get into the 36″ wide realm before the D800E pulls away from the D600. A shame that Canon’s lenses could not be part of the mix. I suspect that they would be on top in this comparison. 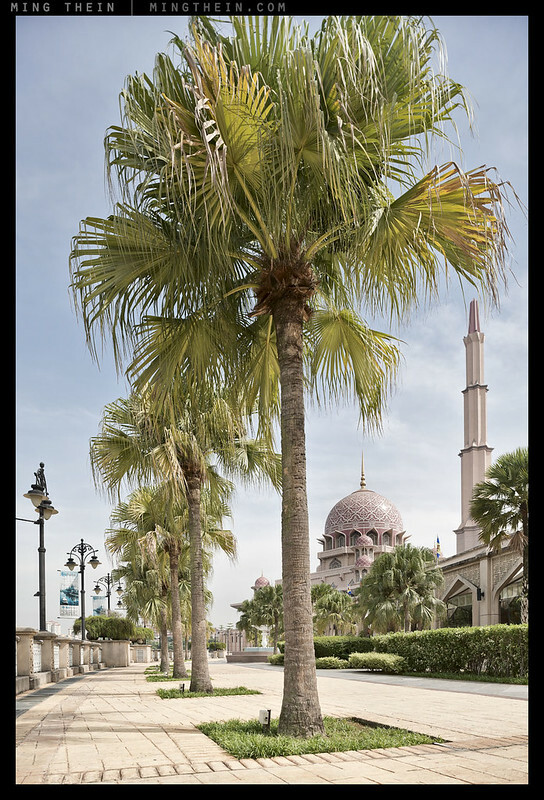 Do you have access to Schneider Kreuznach lenses in Malaysia? Their T/S lenses are said to be very good and come in F mount. Unfortunately not – besides, I don’t think they have a 24 – only 50 and 90mm, if I remember correctly? Hmm, sorry about that fat fingered response to the wrong thread — touch sensitive screens and all that. I was going to say that Schneider has a 28mm T/S, but it’s a moot point if they’re not easy to get in Malaysia. Ah, that’s news. You’d still have to stitch for anything wider, though. I think the file output will remain RGB, due to storage and processing needs, but the Bayer filter colour array could try different variations. A few video cameras, and even fewer stills cameras, did try other than GRGB Bayer filtration. The sensor is much like the Leica Monochrome, in that they just respond to light. Full bright is a full charge on a pixel, whereas full dark (black point) should imply no charge at a pixel. The Bayer filtration blocks certain wavelengths on each pixel, while allowing others to go through. So if you think about it, the Bayer filtration reduces the light actually reaching each pixel. Fuji may be onto something with the X system and the filter variation, but they still lack really useful RAW processing support. Sony had a GRBE array at one point, though that seems to have died a quiet death – I wonder why. GRBY should make sense too, presumably? Perhaps because they could not make use of prior knowledge when demosaicing (if that is a word 😉 ). I would like to see one of the companies give it a go again, though with the problems Fuji is seeing with the X sensor pattern, perhaps never again. Oddly it always seems that Sony is the one company willing to try something unusual. Fuji isn’t having problems so much as third parties aren’t really bothering to invest time/ money into getting a good output result from it – I have no doubt that workflow issues are going to be the main thing holding that system back now, which is unfortunate given that the lens choices and performance are excellent, and they’re finally making bodies that are ‘fast enough’. Sony has a bit of an ADD problem: they try new stuff, abandon it seemingly at random, and land up developing ideas that don’t really work. Go figure. I hope Fuji stick with the X system. Great that they keep the firmware updates coming out, and that autofocus speed is improving. Manual focus peaking seems to be working, though I have yet to try one out. I find the system of great interest, especially in the matter of high quality to low(er) weight. Unfortunately those third parties appear to be holding back the progress of the X system. The full frame Sony with Zeiss 35mm lens got my attention, until I saw the price, and the fact that the eye-level finder is extra ($$$). The other odd thing with Sony lately is an attraction to pancake lenses. At least they are not forcing Memory Stick upon every one of their cameras users. I don’t mind pancake lenses, nor expensive cameras – but I do feel a bit cheated when you’re paying $3k for a camera and they can’t even include an EVF that probably cost $50 or less to make…just feels like nickel and diming. To make things worse, the product doesn’t even feel that premium in the hand. Why not just correct the perspective in post? Firstly, because the perspective is different. Secondly, because you’re interpolating along the edge you stretch, and once you get beyond a certain point, the degradation in resolution is very visible. This is not noticeable for minor corrections, but situations for which you actually need wide angles require getting it right out of camera. Coming up in the digital age and learning A/D converters, bit depths, colorspaces, etc., etc., it’s always so interesting to see how much lenses themselves play a role in things like saturation, contrast [a family member of “sharpness”]… I think this stuff would have been so much more straightforward and obvious in the film days, when we could at all be on one of a few films and the the main variable was very obviously the lens. I think it’s doubly difficult now: you have the sensor response, and the lens response—and the sensor-lens combo response. Triply difficult, in fact. But speaking of difficulty. Which kind of photographer buys these lenses? I mean, those big cameras that look like accordions — modern day examples made by Ebony, etc — seem much better equipped for these movements. Microcontrast sharpness, not just contrast. Definitely: there are some lenses that are theoretically good, some combinations that are good, some that shouldn’t be, and others that should be but aren’t – I’m pretty much at the point where I’m selecting lenses for a specific body. The system matters less and less in the current day of adaptors. 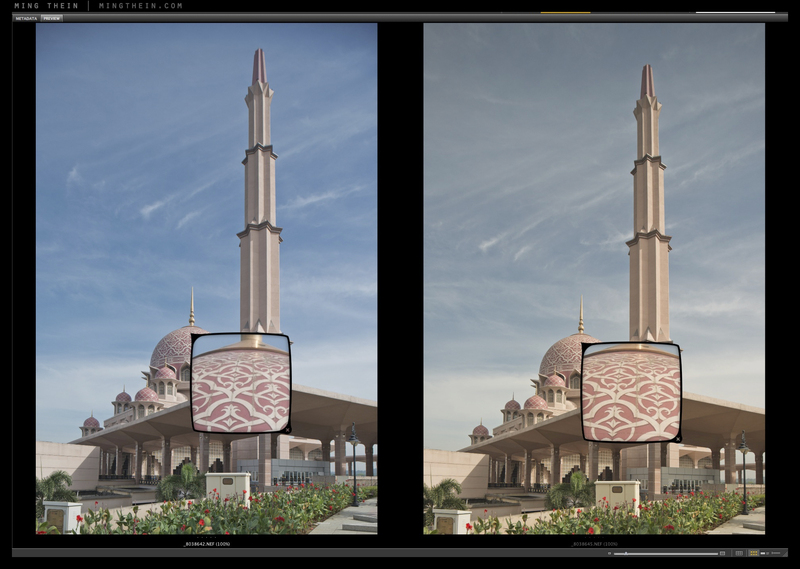 Agreed: large format is much better for movements; you get more control and of course a larger image area. But it’s not easy to master, requires film or a digital back (making cost prohibitive unless you do it all the time), or as practical or fast to use – when you’re hanging off a ledge and you’re as high as you can go, for instance. Yes. And we spoke about this with Todd on the Coolpix A thread, I remember. At the moment we have a branch of cameras which have specific lenses matched and fixed to a sensor, and the combo optimized. And we’re seeing very good results from this [at the cost of photographic utility]. Todd said it, and I agree wholeheartedly, when it comes to more serious offerings we’re perhaps going to see a lot more of that. The Sigma DPMs –> the 1, 2, 3 is a good example. Like them or no, that’s the way one branch of photographic equipment evolution may be going. And I think it can, and should, survive. Though as you also pointed out at the time: when the lens is a lock-in and can’t physically be changed, it had better be good. So the bar for getting a pass, or not, just got VERY severe for the makers of these type cameras. Maybe what the general photographic public needs, in the digital age, is someone to lay out which sensor/which lens/for which photos, in actual practice, and be brand neutral and mount neutral. I think your measured iconoclasm is close to this already; but you’re a working professional Ming and it’s not in your remit or interests to spend too much time on it. I think it’d turn a lot of people onto cameras though: if they knew that the degrees of freedom have actually increased since the passing of the film age and dominance of the digital. If they knew many digital cameras incorporate backward compatibility [old film lenses on modern digital body] the enterprise is way more organic and open ended than the word “digital” conjures. As you know, I’m trying film cameras [because I just like the way color film photos look]. My wife’s friend visiting us this weekend saw a Kodak Retina iic I’d found, broken, had fixed and now use [WHAT a little camera! And this was from the 50s/60s!!!] and went all “oh that’s so lovely!” about it. It is lovely, true. I thought she’d also be interested to see I can use a Nikon lens from 1977 on my 2007/8 Nikon D3. The first digital full frame Nikon camera, no less. So I showed her and she was impressed by that, too. But not as much. I then showed her my current favorite setup, the AF-S 35mm 1.8G DX on my D3. A DX lens on the FX camera. I think it’s really neat. But she was completely unimpressed. I didn’t even bother mentioning the Sigma Merrills to her—though she liked a picture on the refrigerator that happened to be taken by one [and she thought was a film shot! 🙂 ]. Things are more complex now. Not less. There are two levels to this. One is the fixed combination a la GR, A, DPM, etc,; the other is where the whole system was designed ground-up with the optical properties of the sensor taken into consideration too – and these are also excellent. Micro 4/3 and 4/3 are the obvious two; there’s of course the other mirrorless contenders like NEX, X, NX, Nikon 1, EOS M, and at the very high end, Leica S. When done properly, the results go far beyond legacy-lens-on-digital. Put it this way: I am more confident that any M4/3 lens I pick up will work well on my OM-D than I am with any Nikon lens on my D800E, or even D600, for that matter. 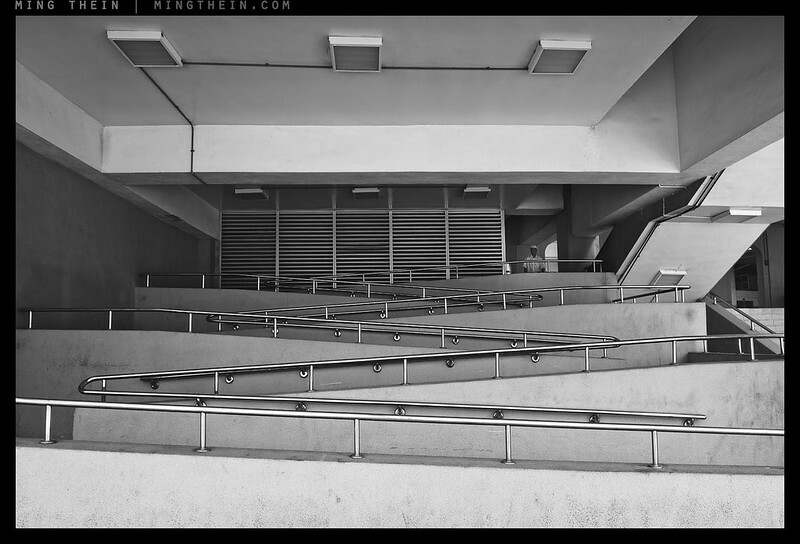 I’ve spent some more time thinking about the way I process digital B&Ws. And I have to say, having shot a lot of film, the gap is rather narrowing; especially the OM-D and CFV, for some reason. It seems to have a lot to do with being very, very gentle dodging and burning the midtones; you leave the shadows and highlights alone once you fix them. As soon as I have this figured out, it might be time for another video. That said, I’ve still got a ways to go with the D800E yet, though it’s still better than it was. As for flexibility: I’ve just sent Bellamy an email to find me a Nikon F(G) to M4/3 TS adaptor. With that…problem solved! Hell, since I’ve got Hasselblad V to Nikon F adaptors too, I could even mount the humungous image circle ‘Blad lenses to the OM-D…though that would be pointless, as it’s one of those combinations that doesn’t work: they don’t seem to quite have the resolving power for that pixel density, sadly. I let this one go, but I’m on the afterglow of sushi/beer and then hot green tea, so I’ll just tap a comment out then knock it on the head for today instead of looking at some photos [100 Nikon D3 files I took today, left untouched… I’m going to wake up at 5:30 or so, 30 min early, do the cut then drop them onto a memory stick and LR them at lunchtime tomorrow or something]. Like the logarithmic shoulder of film, we all know about the diminishing returns as you go up the IQ cost-performance curve; but I think these fixed lens packages disrupt that relationship. I remember being blown away when you mentioned in the Coolpix A review that the A was better than an M 240 and Biogon, or something—an expensive Leica and an expensive lens, at any rate. Maybe it was the M9 and the Biogon. Doesn’t matter to the rhetorical point. You also pointed out that the A even approached the D800E and ZF.2 optics, etc. This was crazy, and unexpected, news to hear. We’re talking about a camera easily one quarter the cost of either set of equipment. Likewise the DPMs… I bought mine, spiritually my first camera, off the back of Michael Reichman’s rave, the backstory of Sigma, the brochure images [from Oregon] and a few prints that the camera shop had up as POP promotions… But the biggest reason was price. Something that knocks on door of medium format quality, 10,000USD territory, for less than 10% of that figure [at the time I had no idea what medF was, but I could infer it meant “better than regular cameras”]. OK, knocking on the door of medium format is total hyperbole, but when the DP2M came out people were really talking like that. And after using the DP3M, yourself, even with all the foibles, I’m sure you could see where people were coming from, Ming. Now, my wife and people around me think the DPM I bought — the DP1M — was expensive. Like “WHAAAAT! ?” levels of expensive. So this is all relative; but anyone who’s even dipped a toe in photography would appreciate that 800USD is not even close to being ridiculously expensive for a new digital camera—especially one we can legitimately label “high end.” Go pick up a Leica MM, for instance. No we can’t because they cost as much as cars and the only place we’re seeing one of them is behind thick display glass at a Leica boutique. So $800 is not the Mount Olympus of camera expenditure. And I think this product [the fixed lens high performance compact, generally] will redraw the boundaries, eventually. But they’ll never gain acceptance as “use in front of the client” professional tools, perhaps. Anyway, the truly digital interchangeable lens formats, u4/3, etc., should do well with serious users like us, as any IQ difference with fixed lens must be minimal [I can’t notice any, but I’m sure they are there, just on first principles: if all I have to design for is one lens on my sensor, then I can optimize that combo a LOT more than if I have to be ready for multiple lenses, even if those lenses were designed with the sensor and mount in mind]. OT [kind of]: I wish some kind, and mad, soul at Panasonic or Olympus would make me a new, and cool looking, regular 4/3 body… stick that Sony sensor and processing gubbins in the body of a DMC-L1, get us a better shutter or mirror system or both –> the “L2”. I’d probably buy two, or three. I can see the CFV, being a CCD and all… but the Olympus Sony unit is a surprise. For me Foveons are still the gold standard in digital black and whites; with CCDs coming in next. I took my wife’s D60 out this last weekend, Ming, and had forgotten how lovely that 10Mpx CCD in there is. You can definitely tell it’s a CCD from the files, but it’s interesting that it’s not as natively curvy as the CCD in my Epson is—there’re both Sony fabbed, but one is five years older than the other [the Epson was from 2006 or so, but its sensor was already two years old when the first R-D1 was released]. I think they, the makers, have been actively trying to flatten response out. Comparing again to the CMOS in the D3 and we’re in a different [flatter] ballpark. Now once more, compared to the CMOS in the D7000 and now we’re getting close to sheer linearity: or so it feels. 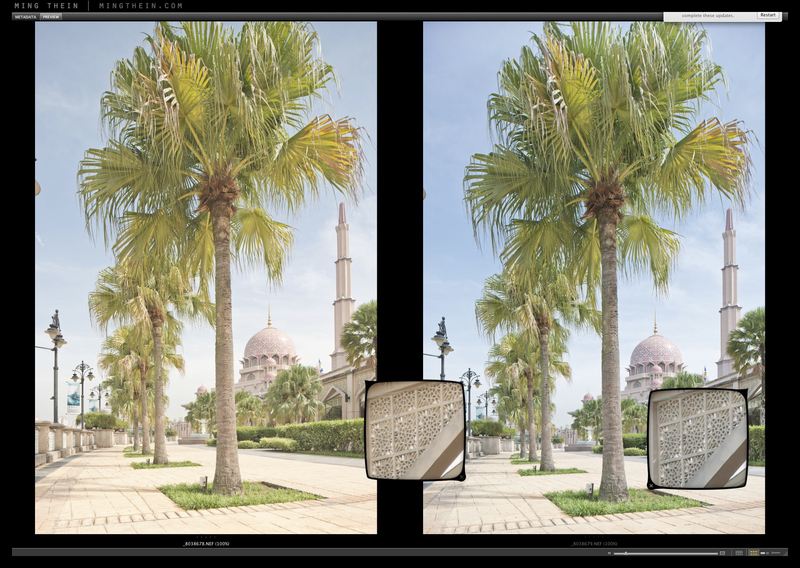 From what you’ve written, the D800E files are quite flat, too. I don’t see this flatness as inherently bad—closer to tabula rasa and good in many ways, perhaps. But I find the more s-shaped CCD files easier to work with and easier to get something from [without having to spend ages on it]. The Foveons, though, wow… just desaturate –> you’re finished. No, OK, that’s not true, you’re going to do the usual tone faffing; but you know what I mean. Less brains required for sure [can you require “less”?]. And still, I’m quite sure it’s just my inexperience with images, but the roll of Acros 100 I put through the F2 and had a highstreet chemist do was DROP DEAD GORGEOUS. I didn’t touch a thing, their processing, their scans, their everything –> and this is a teenage till-poker we’re talking about. Not a salty lab tech! And it came out like a million times better than digital. Every single person I showed them to agreed. And these were mostly laymen. It just felt like there were a lot more nuances of grey in there; but most tellingly, shades of grey I just can’t reproduce in digital capture. Like the notes between two keys, or something. OK that’s my fifteen minutes of fame. I’m sure you’ll enjoy the adapter when Bellamy gets you one, Ming. Though we’d all enjoy seeing a Hassleblad T* hanging off the end of an OMD—or should that be an OMD hanging off the end of a T*? I remember you used the Nikon F to Hassle V adapter on the M240 too. In the interests of photographic science! Fixed lens cameras are seen as expensive because they’re not understood by everybody. And that includes clients, unfortunately – in the end, if they can’t tell the difference anyway, then we should just use whatever passes for ‘good enough’ and gets us work. Sad commercial reality unfortunately. Hmm, I never really liked the Nikon 10MP DX CCD – I found it too contrasty. It lacks the extended dynamic range or even the slightest hint of a toe/ shoulder (or preferably both) that’s needed for nice tonal transitions. I agree that the manufacturers are trying to flatten out response – it lets them claim higher dynamic range etc – but not better images. It does make it easier for them to make very high contrast SOOC JPEGs throughout the entire tonal range, which is what consumers want. Olympus and Fuji are the only two manufacturers that don’t do this to their JPEGs. Flatness is not bad, it just requires more work to get it to where you want. It’s fine for a few files, or a few dozen, but a royal pain for processing hundreds. As for Acros – well, you’ve seen what you can do with it in my (moderately experienced in film, by the standards of some others here) hands…a good chunk of the recent Workers of Heavy Metal photoessays were shot with it. I was snapping with it this weekend and quite liked some of the pictures I got. Of course that’s a limited measure: the snaps only have value to me, perhaps, but I feel like the sentiment is starting to appear in some of my photos—I was just talking about this with Andre, though, it’s always the ones you had no hopes or regard for that people like; and the ones you thought were works of subtle and revolutionary genius are the ones that get barely get a glance. A “meh” if you’re lucky. But yes, that contrasty response works quite well with flash [I just used the onboard one: there’s no time for faffing when out with the kids, plus, I’m out with the kids! I don’t want to be serious or carrying extra flashes about. One of those Bruce Lee “don’t look at the finger…” things, I guess]. Yes, my faith in Acros in wholly predicated on the proof in your, and other’s, pudding Ming. Mostly yours. I remember the Fukuoka monochromes from way back, when you first shared some thoughts on it. 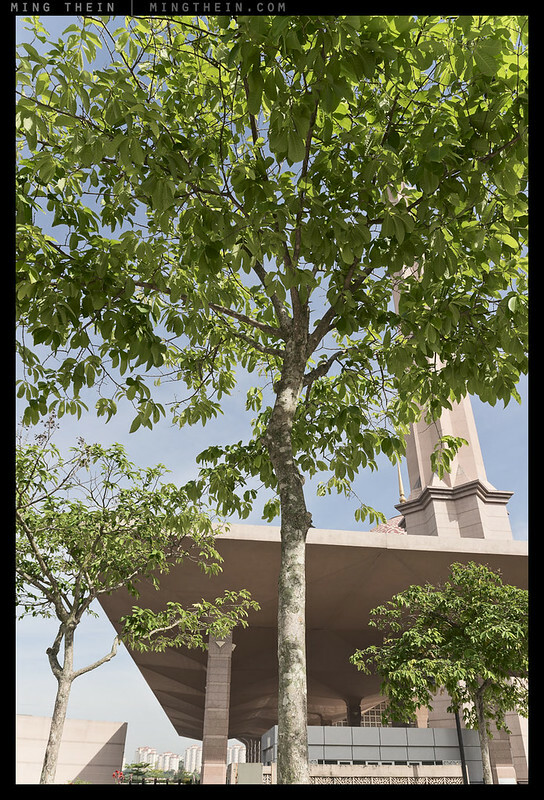 On board flash is by nature flat – light is on the same axis as the lens, so what do you expect? More contrast helps but doesn’t create nice tonal transitions. I had a D40 way back, I’m pretty sure I gave it to my brother and he still has it somewhere – no idea if he uses it or not. I thought it was actually one of the smartest products Nikon made: at the end of its lifetime, good and so cheap that the kit price was undercutting premium compacts, and hooking leagues of people into the Nikon system. That is the kind of camera that the low end DSLRs need to be; price premium doesn’t work in this area, and consumers can’t tell if it’s a 16MP sensor from the previous generation or the new one, so why increase costs that way? PAN-F has a very fragile emulsion. Great 3/4 tones, though. Take great care when handling the negatives; it scratches very easily. Acros is one of the most robust, by comparison. I’d be happy with sensor as is, even the D40 one, whatever –> the dream is a body with proper dials and all the main shooting controls out in the open for me, and with a proper focusing screen. That’s all we want and need for these pleasure cameras. Though bet your bottom dollar as soon as they made that: everyone would be breaking Nikon’s balls for not putting the most modern sensor in it 🙂 I have the Epson R-D1s with me today. The more I think about this one, the more I think Epson got it right [not for all cameras; for this type of camera and what it’s about]. Do it once, never again. There it is: as good as it was ever going to be. Time has ticked on for Nikon and I doubt they could ever make something like the FM3D now. It’d just be affected retro gesturing. Thanks for the tip on Pan-F Ming. I’m off to pick them up now. Hopefully the lab guys had a chuckle at my pictures of people shot from miles away and lopsided pics with all the elements bunched like a train crash on the right hand side. And hopefully they developed them right, all the same. Just to bring it back, nominally, to the “tilt” and “shift” theme! I also don’t think we’re going to see a mechanical-dial digital, other than the next Leica M iteration – and that’s going to be even more prohibitively expensive, probably. Too bad as I think the time is ripe for it. Mixed feelings on the PanF, Ming. I think this one is a bit much for me, but there were some things to take heart from in the exposures. Seemed grainy though? ISO 50 and grainy? The scanner I dug up at work didn’t cover itself in glory—set to scan for B&W film it kicked out brown looking files; when I checked, they were full color sRGBs! It gave me a laugh, at least. And then I realized I’d left the digital ICE on and all the pictures looked like they’d been Rotoscoped. That wasn’t funny, having to spend 30minutes on another turn on the merry-go-round. And I was being Tom Cruise in MISSION IMPOSSIBLE level careful, since you’d warned me. I don’t know how you guys do it. Or should I say, I do know why a fair few pros renounced film and have happier professional lives without it. I’m having great fun as a hobbyist with nothing on the line; but this would seriously test my patience if it were a salaried enterprise. I’m sorry I’m always off topic and ramble and talk about things. But I wanted to let the world know: PanF = not for dilettantes! I found PANF grainy too, unless you develop it very slowly with almost no agitation – this one might be a good choice for stand development, I think. It requires TLC, not a commercial lab. I did say the emulsion was soft. Tmax is similar, I find. And to make it worse, it curls like hell, which means you’re bound to scratch it as you try to straighten it out to load it. Acros is still by far my favorite – it’s the most user friendly film there is, especially in 120; complete lack of grain and incredible dynamic range aside, the emulsion is tough; the packages are easy to open, the tabs have little self-adhesive sticky bits, and it all unrolls/ loads neatly; there’s even a tooth in the spool notch to catch the leader. Concerning Ilford Pan F 50, I just did a quick sample upload of when I used this in the past. I never had the grain issue on scanning that is mentioned. Always used Iloftec DD-X with this film. Personally I like a bit more contrast in my B/W, which is why I stick with other B/W choices. This image was scanned on a Canon dedicated film scanner, which I still use for some work. Thanks for that sample to compare, Gordon. Nice car to look at too. A 170 Cabrio? I was also looking at the grey tones in the concrete paving and the metallic/chrome on the car. Just on tones, in this my first roll, I think this one turned out OK. Was the only one that gave heart [in terms of tones only, again] from the roll. The rest were all grainy, scratched, canted [flimsy film holder], and this is before we consider they aren’t good photographically [though to me, they are enough]. The lighting wasn’t such that the chrome finish on my F2 would have reflected like the bumpers on that mercedes, and the finish itself is quite matte, but it came out quite muddy grey there… and many of the greys in my roll felt a bit like this to me overall—muddy. I’ll give it another go sometime, but think I need a bit more experience and savvy before I try again. Gordon, if it isn’t too presumptuous, could I ask a question? It’s no problem if you can’t, or wouldn’t like to, say! That’s not too bad in terms of scratches/ dust etc – easily fixable with a couple of passes of the healing brush in PS. 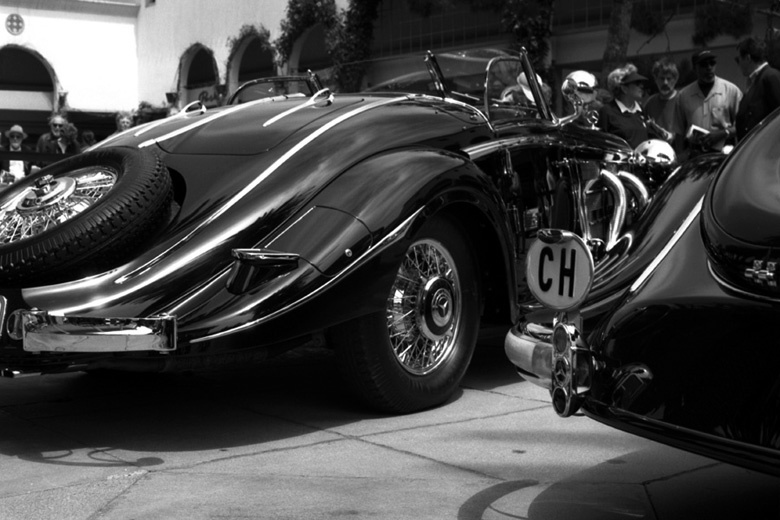 Both cars are Mercedes 540K from different coachbuilders. Best I can recall this was the Nikon FM and I think a 28mm f3,5 AIS; relatively bargain basement camera and lens. Probably my usual scanning in SilverFast as a transparency with a linear curve, then inverting in Photoshop. You can be off with E6 and still have a usable image. It’s not like you get the shot, or end up with a clear frame of film. However, if you blow the highlights, then there is no recovering those. E6 is a bit more like digital capture in that regard, in that proper exposure is better than being off a bit, though obviously digital capture is more forgiving. I use Fuji Acros and recently tried out Fuji Reala (C-41). Scanning is another issue. Obviously I have a dedicated 35mm film scanner, though I also use a giant flatbed. 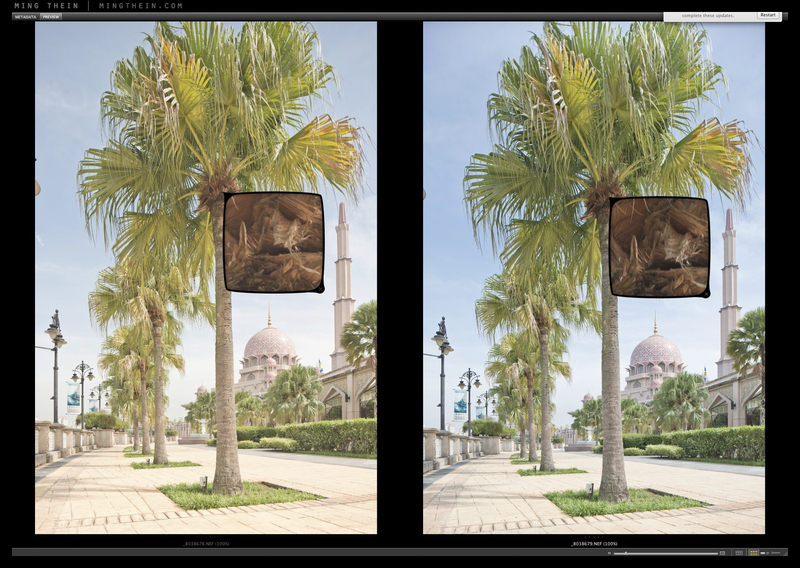 On the medium format and large format images, those are mostly scanned using wet mounting directly to the glass. After years of doing this with holders, glass plates, or clear sheet, I now have a method just for putting scanning oil (Lumina) on the glass, and then placing the film on top of that. There is nothing on top of the film. 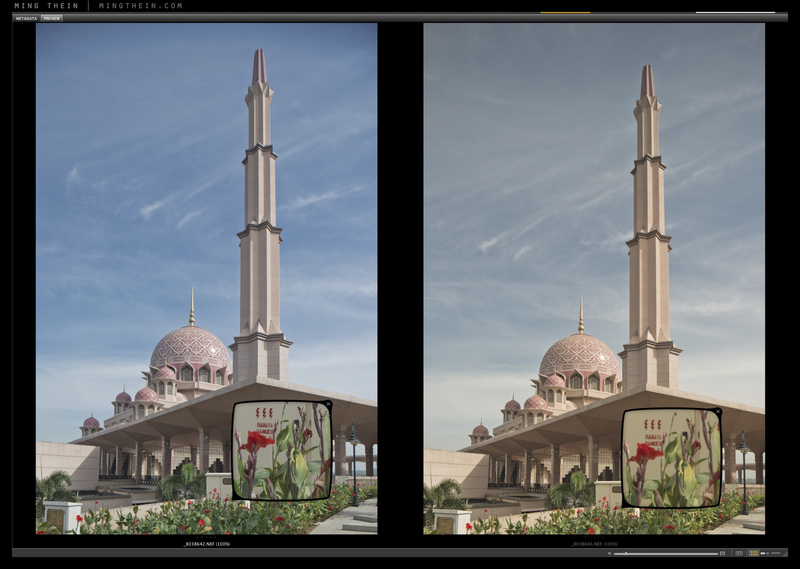 The results allow the best colour capture capability. Of course you are viewing small images on a website, so those are just representational of the final printed outputs. Thanks Gordon. Very handsome cars, aren’t they. I was lucky enough to be in Paris when Ralph Lauren exhibited his collection there about five years ago. It was a business trip but I sandwiched a visit to the exhibit in and there were many elegant cars like this. And like this I didn’t know the names of any of them. Didn’t alter the impact they have. RL had a particularly beautiful Bugati. It was just gorgeous. Ming’s advice (and your’s and everyone’s) is like the bible to me. I read, reread, then read again his articles. I spend tens of minutes looking at his pictures. But truth be told, I’m a bit thick (incorporating “hardheaded”) and once I’m out the door with a camera in my hand, I’m incapable of being rational and methodical and puppydog eager to learn. I just have to do it my rickety and wrong way. And through these epic fails and my friends and family being unimpressed by the photos (or worse than that: lukewarm), all reading made previously sinks in a bit more. I’m not in a rush or under any pressure to improve. But this said, I long for the day when I get some belief in my pictures and people think I’m a photographer. Though I’m not, and don’t want to be (to make a living; I think it’s a dangerous choice and a wreckless thing to aspire to if you are over thirty, married with children). This was basically just an arbitrary hobby to cheer me up after leaving my homeland (for what I knew would be for good); who knew, me in particular, it would turn out that I got *this* into it. Thank you, Gordon, for the note on how you scan. Very much appreciated. I’m sure I’m not the only one reading and not the only one who appreciates it. And I took heart from your words on E-6!! Washing negatives –> had read and considered this. And wimped out. But I need some sort of dispersal agent after washing to ensure evaporating water doesn’t leave salt/mineral/chemical deposits behind? Oh yes: knew about that Instagram border option; and a few of the guys had been using it on the blog. It’s the raison d’être of the “Real Instagram” idea. A lot of other fashion people use the Instagram filters on their blogs; but they know nothing about photography. That doesn’t sound right for people working in fashion, so I thought our guys could raise the bar, but also give their customers something slightly different, but relatable (crazy that they will relate to the real thing via the counterfeit! Welcome to 21st century), most of all AUTHENTIC. I want their brand to take charge of this word: the greater marketing plan is centered around that, but little things like blogs and like this contribute (and often end up punching way above their weight). Oddly it’s usually the things that were never planned to be massive that turn out to be; I was ridiculously happy when I hit a thousand readers a day; it’s about twenty times that now. Authenticity probably helped. I don’t pretend to be what I’m not, and I’m upfront about what I am, I suppose. Ming, I have a Mirex Nikon F to m4/3 T/S units (two actually, although one requires a m4/3 adapter) and I’m open to selling one. Let me know if you’re interested. I’m definitely interested. Are the T and S axes rotatable? Or better yet, independently rotatable? Yes, it rotates but not both parts independently. So it is more like the Nikon PC lens than the Samyang. Google Mirex tilt-shift. The Mirrorless version was fairly but but their are reviews for the SLR version which is the same but uses medium format lenses. Thanks, I’ll send you an email. HI Tom, the big cameras are indeed still viable. The problem is that the kit you carry when you use them is much larger and heavier. There have been a few more recent attempts at medium format digital back technical cameras, though in practice the movements are so finite that it is like setting micrometers; another issue is much higher cost. 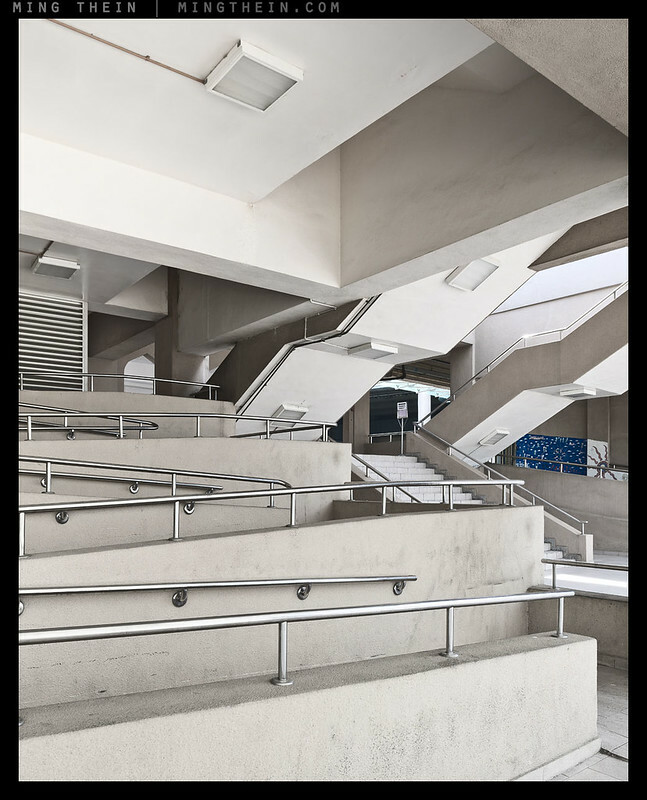 Quite often more modern equipped architecture photographers go with shift cameras and wide lenses, or they move to smaller DSLRs and very wide lenses with “corrections” in software. This goes back to some of the discussions about output sizes, and for architecture photographers shooting mainly for publications, then the smaller reproduction sizes makes it possible to use lesser gear. I even know a few pros who use a fisheye on a DSLR, then just do all the adjustments in Photoshop. At least with a really good fisheye lens, the exposure from centre to edge is very even. Personally, I’m not willing to give up my 4×5 for such work, though film choices are making a rollfiim back more useful. Hi Gordon. Thanks for that. Yes, and MT’s recent architectural post was the latter wasn’t it: D800E, Zeiss 21mm, vantage point as high as you dare [& heavy duty tripod for all else], do the rest in post [stitching with a high degree of overlap –> 90% etc]. And the results seemed very good to me. Most importantly, the customer [who paid for the images] was obviously satisfied. I suppose, as you remind me there, the output media decides everything, makes every choice –> a set of retroactively falling dominoes, all the way back to what’s in your hand when you’re stood in front of the subject. We were talking about a related subject, actually, with a real live architect some months back — I do him a disservice and forget his name, not “Amelie,” that’s a sentimental French film, but something close, Amolie? anyway… — who was shopping for a new camera and had decided upon a Leica M 240! His need was more reportage, “building in use” style photography; but nonetheless, an interesting choice [and I would have done the same if I knew my company would be paying 🙂 ]. We got to speaking about u4/3 as an option for him as the native telecentricity of the mount design straightens light beams and gives excellent corner performance. I’ve certainly found this to be the case on my older 4/3 design: though the body [its sensor and downstream processing] is really showing its age now, the optic performance is excellent; even with the limits on ISO and exposure styles the body imposes, I still use that camera [the DMC-L1] a lot and am always pleasantly surprised with the files when I open them up. Particularly if buildings are in the frame. If we just went on straight lines being straight, sharp corners and general rendition: the 4/3 camera is pretty hard to fault. But precisely because of that inherent telecentricity, wide angles are at the weak end of its repertoire; T/S lenses for 4/3 or u4/3 don’t even exist [he says without checking]. If I remember the thread correctly, in the end we more or less came to the conclusion that the single lens reflex, most probably an FX DLSR, is pretty much the best general purpose architectural choice. Which says more about the consuming end-user of the image than the benefits of that format. That last line Gordon, you mean film choices for 4×5 are thinning out? One thing, even I can say, and what do I know!, but B&W with film is just on a different level. The color shooting — my preference and whole reason for being interested in film in the first place — is great, but boils down to aesthetic schtick. As soon as we starting getting quantitative and objectively so, color digital just kills color film in every department. But B&W seems like it’s on another plane to digital. This must be the analog quarter tones, the highlight shoulders, I’m not sure and couldn’t name it all: but I know what I see and even my best attempts at B&W with any and all of my digital cameras are not even close to the majesty of film monochromes, straight out the chemical baths. So I’m guessing most serious film architectural work, for big output, is done in film, on the big accordion cameras, in black and white? T/S lenses for M4/3 don’t exist, but there are adaptors that use the wider image circle of FF lenses that allow T and S capabilities…which makes things very interesting indeed. I’d consider 4×5 not so much for film but for the ability to bring full technical movements to my MFDB; most of these will mount Hasselblad V-backs via adaptor, which makes my MF digital system very versatile indeed. Different exposures to what you intended can be due to a few things, especially with mechanical cameras – different processing, different printing (if printed), different scanners settings, sticky shutters, different lens T stops…the list goes on, really. All the same, I’d still like to get the SQ a CLA from technicians who know what they’re doing. Then I know, beyond all doubt, that the machine is right. I found a company run by the eldest son of of the founder of Bronica, who runs a Zenza Bronica camera repair service [staffed by ex-Bronica technicians], probably at great loss, as a quiet part of corporate operations in the company he runs nowadays. Will give them a try; but CLAs on the these old cameras cost, don’t they. I think of it as buying a new camera for an amazingly cheap price. Going a bit in reverse on the answers. Many of the remaining big name architectural shooters are using cameras like the ALPA or Arca Swiss RM3D, though the usual is just wide lenses and shift. 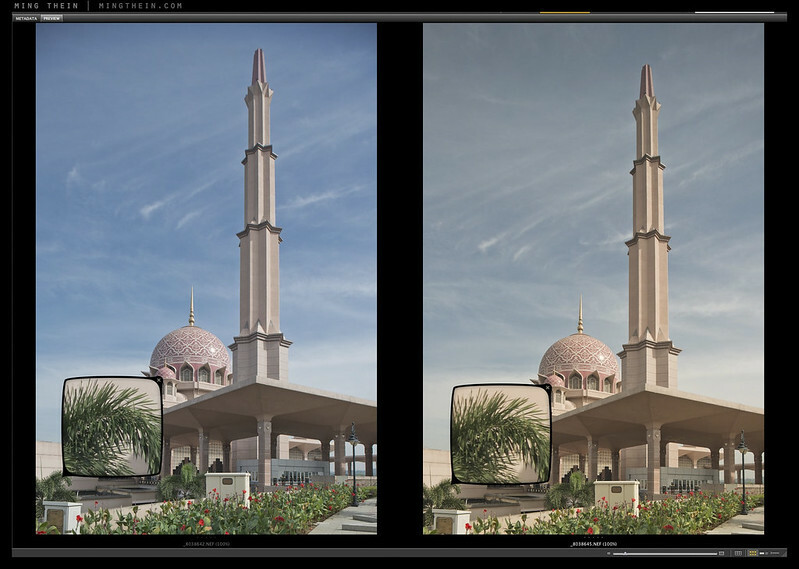 Quite often more complex images are stitched from multiple captures. Swing and tilt are the real tricks on 4×5, though there are ways to work around it with smaller cameras. I know Ming wants to try a roughly 6×4.5 digital back, though that type of set-up is not that easy to use. Geared movements on small capture require more care than with a larger capture area. Basically, it is just easy to see the affects of movements on 4×5, or even larger on 8×10. There are a few stitching backs, like a four shot set-up using a MFDB, and that helps when it is possible to stitch a composition. I will disagree with you on colour films being inferior to digital capture. The choice of a particular colour film has often been for the distinct palette of response, and not solely for accuracy. Textile designers may want absolute accuracy, but when you consider the output requirements, that “accuracy” demand becomes very malleable. Even our eyes will see fabric in a different way under different lighting, so that question what exactly is accurate colour has many answers. The choice of film is a creative choice, despite that some films of the past were claimed to be more accurate than others. Even digital sensors are interpolated, and influenced by the Bayer pattern. Ideally we would have a digital capture device that output CMYK. Commercial printing does not use RGB directly for output, so this idea you have about colour accuracy needs some work, though we have discussed that in the past. Hopefully I am not being too harsh in pointing this out. Scanned film can produce an identical printed output as digital capture, if you get the output numbers where you want them. No doubt digital capture is much quicker, and quite often will satisfy the client that you are getting the shots they want (assuming they are on location with you). There is colour balance for creative effect, and printing can even be pushed to higher quality using Pantones, dull, matte, or glossy touch plates, and even the paper choices can influence the output. B/W film is another option, though not all clients want that. Commercially printed output can be even more complex in order to output the tones in a pleasing manner. I will suggest an Albert Watson book called Cyclops, printed in duotone, with the layout design by David Carson. It is one of the rare correctly and extremely well done B/W image photographic books produced at great expense. I use to shoot Readyloads and Quickloads in my 4×5. Still have a few boxes of Kodak E100VS Readyload, and Fuji Astia 100F Quickload. Since those types of films were discontinued, I bought several MIDO film holders. The problem with 4×5 colour films is a lack of processing places. It is easier and faster to get 120 rollfilm processed. I use a Linhof 56×72 back on my 4×5, which also allows for even greater movements, though the crop means the lenses feel longer. At some point I may add a 6×12 back. Completely agree on B&W printing being harder than color, though – it seems that the combinations of colors give you the illusion of greater tonal range than just monotone, plus casts are less obvious etc…that, and the fact that most products are not monochrome means I find clients generally only want B&W for quasi fine-art images. So I agree, accuracy is not the name of the game here. Aesthetic choices are. And I agree with Nobuyoshi Araki that we don’t want color accurate film shots—the whole reason we love color film shots is that they are not color accurate [not as color accurate as, say, a 14bit NEF from the D7100 might be]. My opinion is that this unreality of film color actually brings us closer to reality. Messy knock about shots I took with a plastic lens disposable camera are about a hundred times more “real” to me, loyal to the living memory, than painstakingly color balanced D3 shots where I really felt like I did well with skin tones, etc. Maybe it’s something to do with the energy in a blurred, busy, unrehearsed disposable camera shot… but I also think the filmic response, and inaccuracy of the film colors, has a part to play. Remember you were telling me about the accuracy of a red vase in the conversation on the sensor size thread? That really stuck with me. You pointed out: anyway I cut it, I see the vase as “red.” Case closed. That convinced me that the concepts are more important than the truth. So it’s funny because my reason for wanting to try, and do well with, color films is not for accuracy at all. It was for sentiment and “just because.” All the famous, and not so famous, images I experienced in my youth were shot in this media. The images that still do something — hard to express in words — to me now, are all color film. I’m sure you know Pete Turner’s work, Gordon, I can look at the African pictures again and again and again. And it’s for the colors; not the subject or the photography, per say. I never tire of that color map. The yellow trash can against blue desert sky. It might be neither here nor there to everyone; but something about the way those color photos come out… Just does it for me. Could say the same about some William Eggleston photos… or that guy everyone loves but was more professionally famous for B&W: Saul, something. I always think of Saul Bellow, a writing influence, so get names mixed up. Saul Leiter! There it is. Though, truth be told, I’m not much of a photo watcher and don’t want to be. I have what I want in my head, more a feeling than an image, and I’m trying to equip myself with the skills to get close. I could care less about photographic artists. Those Pete Turner shots, though, they were good; and they were close. So I’ll try printing. If I like it, then that’s what the end goal of my photography will be. If I don’t like it, I’ll stick with the screen—which I don’t find disagreeable, at all. Wow, thanks for the Albert Watson book: Cyclops. I’ll go look for that on Wednesday: I’m out and about and will go by a few big book stores in town; I usually call in to check the magazines, look for interesting copy to steal… so I’ll budget some time to look at art books too. If it’s in print, it’ll be somewhere in Tokyo. Wow, Gordon, get that E100Vs and Astia to zero kelvin [absolute zero] asap! You might be able to preserve them for future generations 🙂 Though hopefully Kodak still have the recipe somewhere. I bought my first slide film last week: Fuji Velvia (135). I’m still too scared to go out and use it yet—but my fixed up F2 is coming home next Monday, so am thinking I will give it a try in that. I plan to use them for a trying a few prints, just as soon as I’ve figured out how I’m going to prepare my data. Or even if I want to do that; it’s possible to just go directly from negative to print, isn’t it? I’d like to try that, too. So I need to know these things. And how to speak the same language. I didn’t know what “duotone” was for instance. The problem of thinking of cmyk as just cmyk would lead one to believe that it is limited. Learn more about commercial printing, then florescent inks, substitute Pantone yellows, and all other ways of altering cmyk become much more apparent. It is one think to look on a computer screen of a diagram of the cmyk gamut, but it really does not tell you anything about printing. 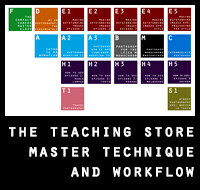 All cmyk is definitely not the same, and even in the computer gamut diagrams there are other spaces. Look at pure cyan or the more greenish blues, and there is no RGB equivalent. I’ve set-up printing item that could not display properly on any monitor, in which case a hard copy proof was the test. There are limits to soft proofing, beyond even viewing environment, monitor calibration, and the eyes of the viewer. I think you need to see some printed items that are done very well, before you see what cmyk can produce. It would not surprise me if you have magazines in Japan that go all out on printing, so perhaps you can find something. I think the engineering basis was video, in which case the display medium (output) was RGB. Sony did experiment with alterations on the RGB choices in Bayer filtering, but I do not think any cameras now use the variations. Cyan, Magenta, and Yellow Bayer filtration is possible, and with those being somewhat weaker it would be a more responsive chip design (probably better than ISO 400 native response). Our editing medium is also RGB, though I don’t think that has as much influence as file sizes. Don’t forget that a CMYK file adds an extra colour Channel of information, which requires more storage. Now that storage is much cheaper, and in-cameras buffers are better, we may see a CMY variation chip design in the future, though I doubt we will see four Channel output. Duotone in the Albert Watson book refers to using two printing inks. Both appear to be variations of Pantone choices. Hard copy proofs, or a few test prints, were probably a necessary step. If you can find a reasonably priced copy of Cyclops, I think you will like it. This book came out in the 1990s, so it may be a little tough to find. The only thing I have that compares is a sample print off a Heidelberg press that used two grey Pantones to make a fantastic tonal range B/W poster. Too much now is being pushed through digital presses with much more limited gamut. MIDO holders are tough to find. You can load packets with five or six pieces of film into one holder. I now have three of these, which means I could get off 12 shots before I need to reload. Best of all these take less space than regular two shot holders. The Readyload and Quickload systems were even better, in that they took up very little space. Polaroid made some of the packet systems under contract for Kodak, on a machine that had in the US. I’m not sure what Fujifilm did with the equipment for Quickloads, and they also had in Japan (and no place else) a system like the MIDO holders. Once too many professionals moved away from 4×5, and enthusiasts mostly did B/W large format, that was the end of those systems. I do wish Fujifilm still made Astia, which is just amazing with skin tones, though I am lucky to still have some in the fridge. Ah, OK. The MIDO holders sound just like the Polaroid back (the basic idea) I have for the Bronica SQ. Thanks Gordon, I get it now. Cyclops is on the list; I might see if there isn’t an introduction to commercial printing book while I’m at it. Gordon, you got my attention at David Carson. It seems there are at least 3 different versions of this book, from searching around the Internet. 2 first editions: one small- and one large-format, and then a small-edition reissue, or maybe there was just 1 version of the small format? They all seem to claim quadtone reproduction. Is there a particular one you’d advise looking for? BTW, The Online Photographer offered a high quality quadtone book (which actually used a 5th ink) of Edward Weston photos a while ago: http://theonlinephotographer.typepad.com/the_online_photographer/2012/10/edward-weston-book-offer.html I have a copy, and it is beautiful. Hi Andre, I had the good fortune to meet David Carson when I was getting my degree in Art. I’m a big fan of his work. It may be that there was a quadtone print, though the small one I have does not seem to be that. If you like the images of Albert Watson, then I think you would enjoy any version of this book. Some of the editions are very expensive. There are a few options on printing that can generate some great B/W images. Technically any four colour press could accomplish this, though the trick is getting the files set-up properly. I’m not even certain whether they teach this in college anymore, though that was my first exposure to duotone, tritone, and quadtone printing. It would be interested to see that Weston book. Thanks Gordon. I think Carson endeared himself to me when I heard he set an entire article in Zapf Dingbat because he thought it was too boring to be read. I think he liked challenges like that, and he did quite a bit of experimenting with typography and layout. I have some magazine samples of his work, and one of his books, though I cannot find that sample. I may have seen it in one of his other books. David Carson is very much the opposite of the type of work you do; there is an audience for it, though I’m not certain you would like his style. It probably isn’t, but I’m still curious to see it all the same…in the interests of visual art and all that. He started what some call the grunge typography trend where most things look like mistakes (and in fact, many were honest mistakes in the beginning) — think of it as the typography equivalent of the Instagram/Holga filter phenomenon today, especially the light leaks and cross-processing effects — and was badly copied by many people who used it less artfully and, more importantly, less F***-You than he did. The ironic thing about such effects is that they lose a lot of their expressive power when they become popular, and they just become an affectation that is a proxy for a real idea. The Bryan Ferry article was published in his Ray Gun magazine, which was itself pretty experimental, so this wasn’t at all mainstream media. The article was printed in plaintext elsewhere in the magazine. Isn’t that the case with most art/ style/ design though? Once anything becomes commonplace, then it looses its punch. Perhaps I’ll have to try something new soon…like shooting everything in reversed color, for instance. For when those times when you forgot your Spiderman suit. Reblogged this on Styron's Photos. Excellent explanation and very timely as we were having a conversation about Nikon TS lenses at work last week. I forwarded your article and he is going to rent the Nikon to try. I purchased the Compendium or at least part of it. I am using Phtotoshop CS2 and when I click on Channel Mixer, it is obvious that you are using a different version. What version do I need to perform the functions you do in Black and White Conversion video. Yes, the videos were produced in CS5.5. I haven’t used CS2 in years so I admit I can’t remember how the labeling has changed, but the function should be there – sorry!